Men and women waste valuable time every month grooming their facial hair to cooperate and look appropriate for work and social gatherings. Women are often frustrated with their upper lip, unwanted sideburns, and chin areas. Men experience difficulty maintaining neat necklines and beards and even nose and ear hair. Tampa Laser Hair Removal provides you with the best and most effective laser hair removal services wherever you may want. Since the skin on your face is so sensitive, harsh hair removal treatments like chemical creams, shaving, and tweezing can cause irritation and inflammation. Red bumps, razor burn, and ingrown hairs are likely to interrupt all of the work you put into grooming. It’s so frustrating to spend time and money attempting to control facial hair only to feel self-conscious and unhappy with the results. 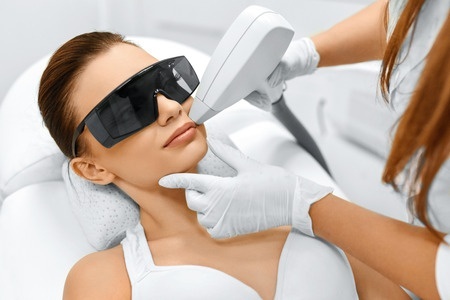 Laser hair removal offers permanent hair reduction that is safe, gentle, efficient, and reliable. At Tampa Laser Hair Removal we meet the needs of all of our patients using lasers developed by one of the leaders in energy-based technologies. Our LightSheer Desire laser offers advanced benefits that set the “Gold Standard” in the laser industry. The Desire laser uses a vacuum to gently pull the skin into place on a hand piece that brings the targeted hairs closer to the laser’s energy source. As energy is applied to hair follicles, your unwanted hair is damaged at its root and permanently removed. This system allows hair removal to occur very quickly and with minimal pain. Better yet, the Desire laser is the epitome of safety since it uses very little energy to attain hair removal goals. Your skin is never at risk of being burned or injured. Laser hair removal for the face creates a beautifully smooth appearance that looks completely natural. Rather than dealing with a chronic 5 o’clock shadow or sideburns that won’t stop growing, you can instead enjoy gorgeous bare skin. No more razor burn, no more unsightly ingrown hairs! At Tampa Laser Hair Removal, we work personally with every single patient to ensure a customized plan for laser hair removal based on needs and goals. After your treatment, you will look groomed, feel more confident about your appearance, and finally be able to stop wasting time and money on inefficient razors. The medical professionals at Tampa Laser Hair Removal are here to help you Go Shaveless! Call 813-778-0045 to schedule your laser hair removal appointment today. Copyright © 2019 Laser Hair Removal Tampa Bay. All Rights Reserved.